Displaced and on the road to somewhere. This defines the lives of the more than 28 million children who had been forced to flee their homes as of 2016 — unfortunately, these numbers are a part of a growing trend. We define a “child on the move” as any child forced to flee their home. This may be due to war, local violence, extreme famine in the areas where they live, extreme poverty, lack of opportunity, or persecution. Children are displaced in their own countries or have crossed international borders, including via human smugglers, by boat, or by foot. A child on the move is a child who has experienced extreme stress and who is vulnerable. 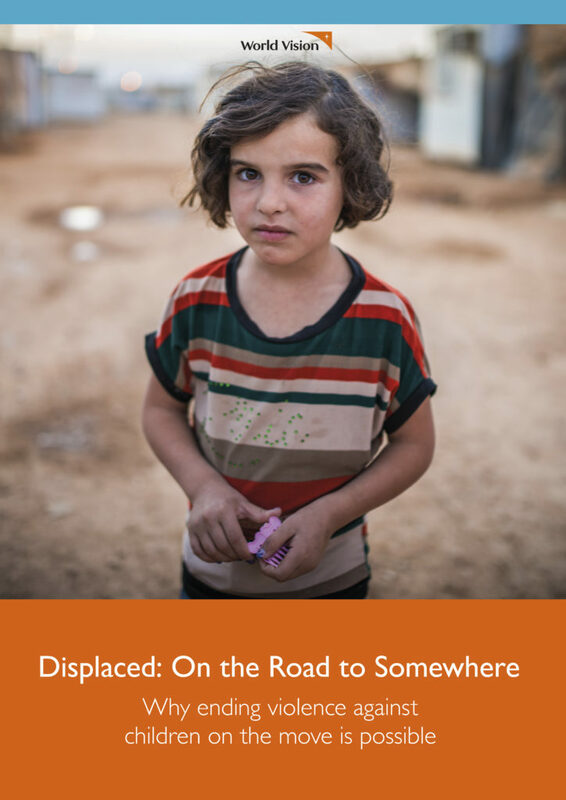 World Vision USA worked with global partner offices to release a new report that highlights this issue across contexts and highlights what can be done to end violence against children on the move. Every child has a different story but common threads of courage, fear, resilience, and facing violence tie their experiences together. The report reflects on the violence children face that pushes them to flee, violence children face during displacement or migration, and violence they may encounter when they arrive at their destination. Inside you see a snapshot of what is possible to end violence against children on the move. Drawing on World Vision’s experience in South Sudan, Uganda, Central African Republic, Democratic Republic of Congo, Syria, Central America, and East Asia, the report offers five critical elements to address violence against children on the move. Empowering children as agents of peace. World Vision will use the report to call international and national decision-makers to act and prevent violence towards children on the move, in all its forms. We are asking you to do the same. This report not only contains valuable information and policy recommendations, it is also a valuable tool. This week, World Vision will host a congressional reception to launch the report. Bringing together Congressional staff, staff from key government agencies, and peer organizations, this event will highlight global trends and show the importance of working collaboratively across the U.S. Government to address violence against children on the move. Whether your members of Congress are less informed on this issue, or this report could be a valuable tool to use in talking to their colleagues, get this report into their hands! Enter your information below to find your elected officials. Check the people you want to send your message to (you can repeat this process if you want to send different emails to different people). Copy and paste one or more of the points below and personalize! As of 2016, 28 million children had been forced to flee their home due to conflict, violence, and fear for safety. Children who are displaced are more likely to face violence, including physical, mental, and emotional abuse, trafficking, and recruitment into armed conflict. Please use the content of this report and the policy recommendations to work with colleagues and protect every child, no matter where they were born. With political will, ending violence against children who are displaced is possible. Fill in the information below to find your members of Congress. Break through the noise: Say where you live, share why you care, and be direct with your ask! 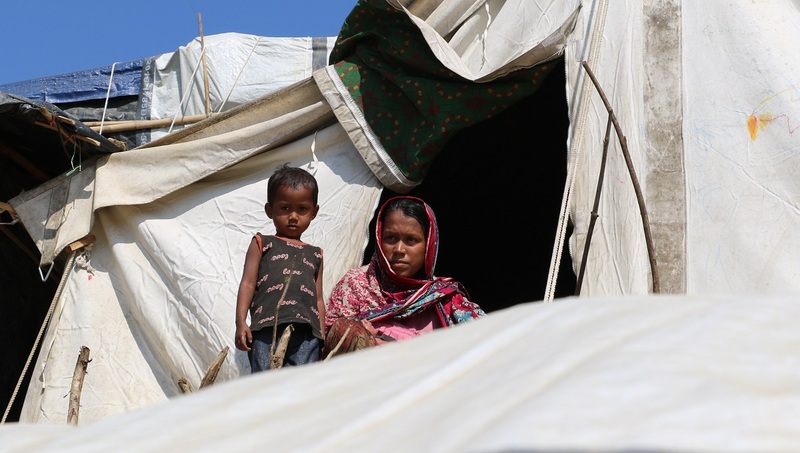 Photo: Azida, her son Lunus, and her newborn baby in front of a World Vision tent in Cox’s Bazar in Bangladesh. World Vision has distributed 100 tents and 6,500 shelter kits among the refugees here in partnership with International Organization of Migration. ©2018 World Vision, Md. Golam Ehsanul Habib. Please consider and read up on this plan to help very vulnerable children.